We’ve discussed video games that were turned into films before, but how about horror film to video game adaptions? The best are the ones that you can’t bear to play without the lights on or – better – the ones that make you squirm so much you have to hand over the controller. So what are the horror games which best illustrate what the industry has to offer? The Alien franchise has long been a favourite for multimedia adaptions. As far back as 1982, we saw releases for Atari 2600, with various new entries and spin-offs since then covering a huge variety of platforms and sub-industries. Why do we bring this up? Well, as it just so happens, there have been some Alien games which ran the less than amazing side of the spectrum, with Alien Colonial Marines being a collective kick in the gut to Alien fans and gamers both. More hilarious than frustrating (it was apparently due to a simple typo), fans of Alien were understandably nervous about Alien Isolation. What they got, however, was not just a great Alien game, but one of the greatest games of the year, which still stands at the top tier of horror gaming offerings. More Alien than Aliens, Isolation had players against just one or two xenomorphs at a time, as they did their best to avoid the apex predator. The further you get through the game the more the xenomorph learns, and the more deadly it becomes. The kicker is that even with all of your tricks and traps, as well as a few jury-rigged weapons, you can’t kill the xeno – you have to merely scare it off so you can run and hide. 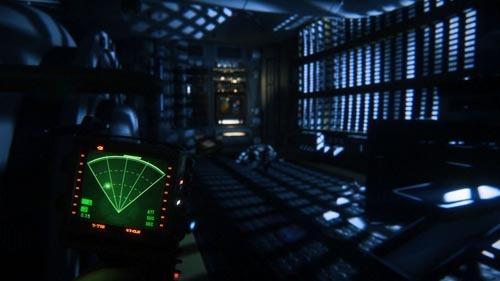 A graphical powerhouse of a game, also available in VR with a few hacks, this is the game Alien fans have wanted since the original film, and it was just as terrifying as they hoped. Another film series which has had various games attempt to capture the horror of the original series’ formula, and another series where these attempts run the gambit of style and quality. In fact, the early NES game titled Friday the 13th is considered by many to be one of the worst adaptions of all time. How do you capture the terror and unpredictability of somebody like Jason anyway? And how do you implement this into a game which can be both satisfying and terrifying? The answer came from Gun Media and Illfonic in an asymmetrical multiplayer game. What this means is that, while there are a total of eight players in a single game, only one of them plays as Jason, while the others find themselves in the shoes of the often doomed camp councillors. While this concept itself has enough promise to get our attention, the developers have really gone above and beyond when it comes to catering to fans of this long-running series. The different counsellors all come with different strengths and weakness. Attempting to survive alone is possible, but the best solution is usually to find some way to work together to escape. The nigh-unstoppable Jason, on the other hand, makes it his mission to pick off these teenagers one-by-one, until he’s the only one left standing. It is possible to down this monster of a man, but keeping him down for good is a rare accomplishment, and we love this faithfulness to the gory source material. While not itself based on any direct horror film, there is perhaps no better illustration of a horror film in video game form than with Supermassive Games’ Until Dawn. Developed solely for the PS4, this game is a sort of interactive horror movie, with all the tropes and terror this implies. Decision making is the key component of the gameplay in Until Dawn, as players take control of a variety of different characters during their stay in an isolated lodge in Western Canada’s frigid mountains. Until Dawn succeeds as a narrative-driven experience in a way that few games ever do. The game also does a lot to subvert expectations in terms of its characters. Easy to pick up even for non-gamers, Until Dawn is a horrifying treat and one which can go horribly wrong if you don’t pay attention. Every character can die in this game, which adds ample tension to an already nerve-racking experience. Despite being a longtime favorite with many horror enthusiasts, some film franchises struggle for decades within the mainstream film consciousness. The Halloween film series is a strong example of this, often being confused for the Friday 13th series. Nevertheless, this series has also found a home in games, albeit of a slightly differing nature: an online slot. A good way to try the game out for free before committing to spending your cash on Microgaming’s Halloween-inspired slot is to take up review site offers for free spins – that’ll take some of the fear out, for sure! But gamers and movie fans alike are praising this game’s ability to lean on the nostalgia of the old, with stylised shots taken directly from the film to secure that link to the original series. It’s arguably smaller, popularised developments like these which helped lead to the creation of the 2018 Halloween film sequel. That received much more attention to detail and quality than many other entries. In turn, this helped establish the film as a return to form, with many critics noting it as one of the best horror films in years. With VR standing as one of the most promising technological developments in horror media ever, we can’t wait to see what the future could bring. Even with more traditional gaming styles, we’re glad to live in an age where gaming creative vision and processing power can finally give life to interactive versions of our favourite films. So what series do you think deserves proper video game adaptions, and how would you want them to play out?